^ a b c d e f g h i j k l m n o Lambert, Olivier; Giovanni Bianucci, Klaas Post, Christian de Muizon, Rodolfo Salas-Gismondi, Mario Urbina, and Jelle Reumer (1 July 2010). 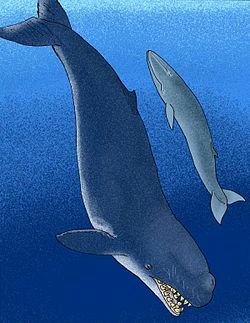 “The giant bite of a new raptorial sperm whale from the Miocene epoch of Peru”. Nature (Peru: Nature) 466 (7302): 105–108. doi:10.1038/nature09067. PMID 20596020. http://www.nature.com/nature/journal/v466/n7302/abs/nature09067.html 2010年7月2日閲覧。. ^ Lambert, O.; Bianucci, G.; Post, K.; de Muizon, C.; Salas-Gismondi, R.; Urbina, M.; Reumer, J. (2010). “The giant bite of a new raptorial sperm whale from the Miocene epoch of Peru [Corrigendum]”. Nature 466 (7310): 1134. doi:10.1038/nature09381.